Earlier this month, we wrote about Pepsi's Santa Claus commercial, part of the soda brand's cheeky "Summer time is Pepsi time" campaign, which shows characters traditionally associated with Coca-Cola advertising suddenly switching sides to Pepsi when the weather gets warmer. Here's another spot along those same lines, perfect for the hottest week of the summer, featuring polar bears—also well-known Coke loyalists—giving Pepsi a try when a rogue family member floats through the Arctic on his giant yacht. The bears are trying to enjoy their version of summer in their freezing habitat—they've set up a beach umbrella amid the ice and snow—but really they're just snoozing, unable to shake their seasonal depression. Thankfully, Uncle Teddy arrives to rouse them from their slumber. "What are you guys doing?" asks Teddy, who's all tan and outfitted in mirrored shades and a Panama hat, with a couple of polar-cap-melting hotties in bikinis dancing next to him. "It's summer! Let's hit the beach. You need a Pepsi. Let's have some fun!" He tosses a can of Pepsi to Daddy Bear, who ditches his bottle of Coke and lugs the whole family onto the yacht for a trip to the Caribbean. Coke hasn't commented on the Pepsi campaign so far, although some Coke fans are peeved at what they see as a hijacking of their brand's iconography. Massimo d'Amore, CEO of PepsiCo Beverages Americas, says it's all in good fun. "Like many wars, there are moments of truce and moments of war," he says. "Consumers like the healthy competition, and we felt this was the right time to have another episode." 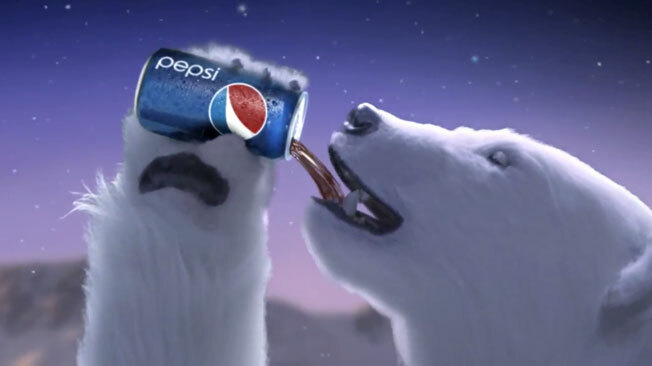 And perhaps there's supposed to be an environmental slant to Pepsi's involvement with polar bears. For whatever reason, the "Uncle Teddy" spot, viewed more than 1.5 million times already, is filed under "Nonprofits & Activism" on YouTube. Music: Montell Jordan "This is How We Do It"